F.S. Crate and Sons began in the summer of 1930 as a fishing boat rental operation. Although times were tough, with their knowledge of boat building along with a strong family work ethic, F.S. Crate and Sons not only survived, it grew steadily to where more docks, buildings and even a gas pump were required. During the 1940's the Crate's boat building expertise shifted from small fishing boats to launches and cruisers, many of which were custom built. Many of the Crate Crafts built are still in service today. By the mid fifties, Fred and his sons realized that there was a growing demand for more boats than they could build. F.S. Crate and Sons became a Chris Craft dealer and soon became Chris Craft's largest dealer in Canada. In 1964 Lloyd Crate took over the helm of F.S. Crate and Sons and by 1987 Lloyd Crate became sole owner and F.S. Crate and Sons became Crate Marine Sales Limited as it is known today. Building on the strong work ethic carried over from generations before them, an acute knowledge of boats and a straight forward honest approach to their customers, Crate Marine Sales has grown steadily. Though times have changed dramatically since we began in 1930, the fundamentals are exactly the same: dedication to superior customer service, top-notch facilities and a hassle-free boating experience are what Crate's is all about. 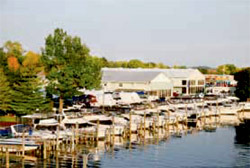 Escape from it all and discover a boater's paradise at Crate Marine Sales, your gateway to Lake Simcoe and Georgian Bay. - In 2010 the opening of Crate's Port McNicholl on Georgian Bay Today, the family tradition continues with the fourth generation of Crate's working alongside a staff of dedicated employees that take your boating very seriously. While the physical size of Crate's has grown dramatically over the years, for the Crate family, their employees and customers it will always be a great place to call home.